Where do you obtain your images? Are you using images that you created, or images created by fellow employees? Are you using images you found on a website or on Instagram or FaceBook? To determine whether you’re legally using images, first consider the source of the image, then consider your use of the image. You will find the following tips helpful in mitigating your chances of infringing the intellectual property rights of copyright owners when using their images. More and more we’re using images to enhance text-based documents, annual reports, websites and on social media. As a universal rule, most images are protected by copyright laws around the world and you need permission to use the image as is, or to adapt it. Let’s look at some of the specifics surrounding this general rule. two-dimensional and three-dimensional works of fine, graphic, and applied art, photographs, prints and art reproductions, maps, globes, charts, diagrams, models, and technical drawings, including architectural plans. So illustrations, photographs, charts and the like are all protected by copyright. Certainly, if the image is part of the design of your blog and/or repetitively used or adapted for your use, you need permission to use the image. 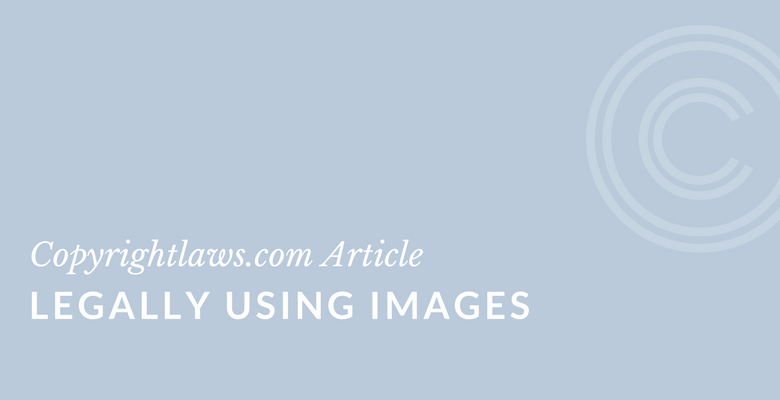 If the image is part of a particular posting or page in a blog, you need to apply the fair use factors and determine on a case-by-case basis whether your use requires permission. Also see 6 Essential Tips for Legally Using Images. When do you have to be concerned, copyright-wise, about using images in course materials and learning management systems? Learning material is often enhanced with images. In an academic setting, the application of fair use to using images in course materials especially one-time/one-semester use of an image in a university course may be considered fair use. For information on using copyright materials in the classroom click here. Libraries, archives and museums are large users of images in exhibitions, displays and public materials, and of course on their websites and on social media. If this is you, see the article Legally Using Images in Libraries. Those familiar with fair use know that it’s always up to a court of law to determine its applicability in any one situation. As such, if you need reassurance or are in doubt, it’s always best to obtain permission. If the image you’re using is in the public domain, including a U.S. federal government image. Note that not all government works are in the public domain. The U.S. government can own copyright when a non-government employee (e.g., consultant) assigns rights to it. The image has a Creative Commons (CC) license. Read that license! Does it specifically allow your use of the image? What do the terms and conditions of the CC license permit and is your use within those parameters? Remember to acknowledge the copyright owner. Start thinking about your best practices to lower copyright risks and how you can incorporate information in this article into your daily work. In the U.S., the creator of a work of visual art has additional rights set out in the Copyright Act. These moral rights grant an artist the right to have their name on their work and to prevent modifications that may be prejudicial to their reputation or honor. a still photographic image produced for exhibition purposes only, existing in a single copy that is signed by the author, or in a limited edition of 200 copies or fewer that are signed and consecutively numbered by the author. or any work for hire (i.e., work made in the course of employment duties). When Do Moral Rights Come Into Play? However, in most countries outside the U.S., authors of all copyright-protected works — such as photographs, drawings, business documents and computer — software all enjoy moral rights. Thus, when using images on websites or blogs, you should respect the moral rights of attribution and integrity. This is because authors have moral rights in countries where their works are accessed (if that country grants moral rights). see our Copyright Leadership Certificate.